The Master Lock Street Fortum Lock Gold Sold Secure-D is made from hardened steel with inner dimensions of 210mm x 110mm, and has a Master Lock Security Level rating of 9. In order to provide protection from picking, the Master Lock Street Fortum Lock Gold Sold Secure-D features a disc key and a hardened steel shackle to resist cutting. In addition, there is a rotating keyway cover to help prevent dirt and water entering in poor weather. To prevent damage to paintwork, the thermoplastic cover stops any scratching. 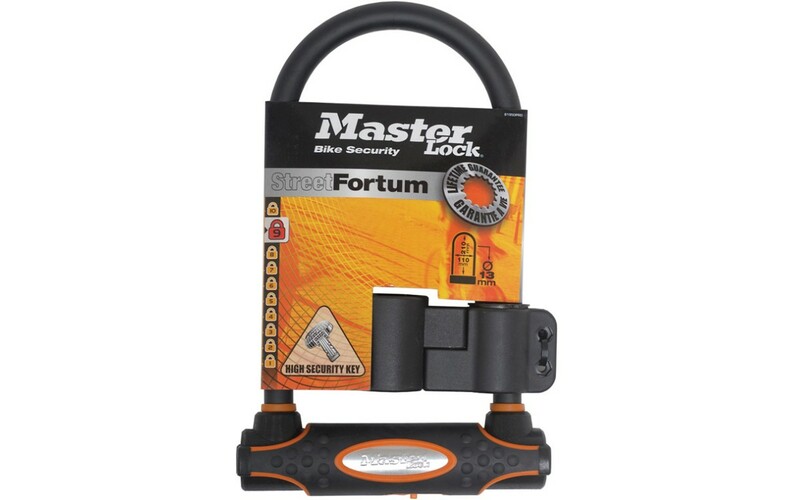 The Master Lock Street Fortum Lock Gold Sold Secure-D also comes with a carrying bracket to attach to the frame.